"Today, the need for leaders is too great to leave their emergence to chance." 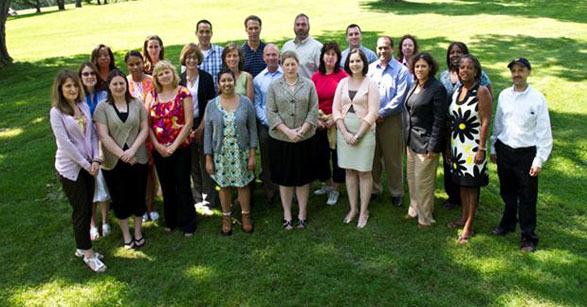 The Northeast Public Health Leadership Training Institute (NEPHLI) is a 10-month program which brings together public health professionals who are committed to building and improving their leadership skills to promote the health of their communities and beyond. The curricula is delivered through a blended learning approach which consists of three in-class retreats, online discussions, self-paced courses and webinars. Throughout the entire program, NEPHLI scholars are actively engaged with each other as well experts and leaders in the fields of public health, collaborative leadership and organizational behavior. To provide state of the art leadership training for public health professionals that will enable them to maximize their ability to improve the health of the communities they serve. To increase leadership skills and competencies of scholars and promote public health through collaborative relationships. To create a public health leadership resource pool to promote continuous and self-sustaining learning opportunities. To continually assess and modify the content and learning modalities of NEPHLI to meet the ever changing needs of NEPHLI scholars. The curriculum is delivered through a blended learning approach including multi-day in-person retreats and online learning sessions (e.g., online discussions, self-paced courses and/or webinars). The overarching framework for the NEPHLI curriculum includes the core functions and 10 Essential Services of Public Health and the Core Competencies for Public Health Professionals, with a focus on the Leadership and System Thinking Domain. Topics that have been covered in the past include: understanding managerial preferences, development and derailment of leaders, developing vision and mission statements, individual and collaborative leadership, team building, problem solving, advocacy, coalition building, risk communication, emergency preparedness, program evaluation, social marketing, and health equity. My NEPHLI experience was the best educational and networking experience in my professional career. The programming, speakers and the retreats were all “First Class” in my book; truly a unique and valuable leadership program. The NEPHLI experience, and especially the facilitators, faculty and my peers, brought to life the critical elements of leadership in public health. I continually strive to incorporate the 5 practices of exemplary leadership into my work. I began the NEPHLI program while in a local public health position that provided me with autonomy but limited opportunity for advancement. The leadership training and skills I acquired through my participation in NEPHLI empowered me to seek out public health leadership positions and half way through the program I acquired a Health Director position in a new community. The NEPHLI speakers and instructional tools provided me with helpful self-evaluation and the encouragement from my fellow 2010 Scholars was instrumental in fostering new confidence and ability to seek out an advanced and satisfying professional position. My NEPHLI experience allowed time for me to reflect on my strengths and weaknesses, and recognize areas for improvement and growth. As our coach, Mark was the unbiased objective voice that helped me broaden my focus and expand my scope of self-reflection. At NEPHLI I learned how public health professionals can address public health needs within a range of settings, from towns in which small teams are responsible for many aspects of public health, to cities in which staff fill specialized roles in large agencies. Lessons about how to achieve both broadly and narrowly defined goals have been valuable to me in carrying out my public health responsibilities. I recently completed NEPHLI and found it to be one of the most rewarding educational experiences I have had. NEPHLI can teach you what it takes to be a leader and how to use the tools they provide as levers for action.